Dual reclining sofa in soft grey upholstery features deep bucket seating, pillow top arms and a drop down table complete with cup holders. 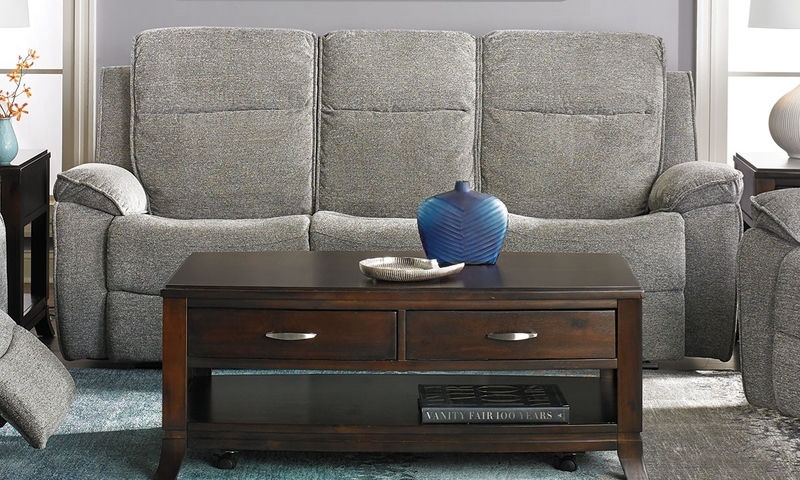 Accentuate your living space with the inviting design of the Castaway sofa from Klaussner. Soft grey upholstery and deep bucket seating make this 89-inch piece the perfect place to curl up after a long day. The recliners on both ends each feature a sumptuous pillow top arm and padded chaise for extra support and comfort. The center back of this sofa even drops down to reveal a table equipped with cup holders, so you’ll never have to leave your seat!